We’re going to be straightforward with you – if you watch movies or TV at home without any type of home theater system, you are seriously missing out. Unless you have an extremely high-end television that already has an amazing audio system built in, you’re going to want to invest in some sort of home theater system. They make any movie that you would normally watch truly come to life. Often times, they can also double as a great audio system for you to play music through so it’s really a win-win situation. So what is the best home theater system? Gone are the days where you have to spend $1500 on a completely new system. You’re able to get home theater systems that will greatly change the way you watch TV for $300, $200, or in a couple of cases, under $100! We’ve compiled a list that contains a wide range of home theater systems varying from $60 to $849. So take a look and see which one will be best for you! Before we get into each of the individual product reviews, let’s take a quick look at each of the systems and a couple of key features. Great! Now that we have an idea of what we’re going to be looking at, let’s delve into all the details. 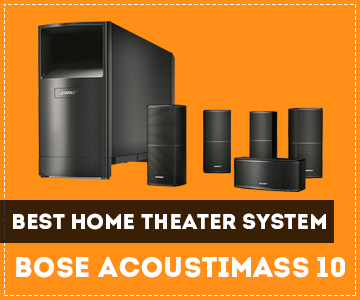 Not surprisingly we’re starting off our list with a home theater system from Bose who is one of the leaders in the audio industry and has been for years. One of the great things about home theater systems from Bose is that they don’t require a bunch of speakers in order to create the “surround sound” experience. Since each speaker is of such high quality and so high end, having just a couple Bose speakers can often times be the equivalent of having five speakers that are actually throughout your entire living room. And this is definitely the case with these speakers so do not be fooled! While it only consists of an acoustimass (what Boss calls a subwoofer), a sound bar, and a smaller speaker – it still creates as powerful of a sound as any five speaker system. So is the price tag that Bose is inevitably going to demand for a set of their speakers worth it? Absolutely. The sound that comes from the sound bar is very spacious and creates a sound much wider than just the sound bar. The sound bar is only 17” wide but the sound is crystal clear and easily fills even the largest of rooms. With the sound bar delivering crystal clear highs and mids and the acoustimass delivering powerful bass, you get a very robust sound that’s full an exciting. Another great aspect that not all speakers allow, is that you can actually mount them. This can be a big selling factor if you don’t want to have to just set these speakers around your room. The input is HDMI and comes directly from the TV and since it’s a direct connection, the sound quality is very high. 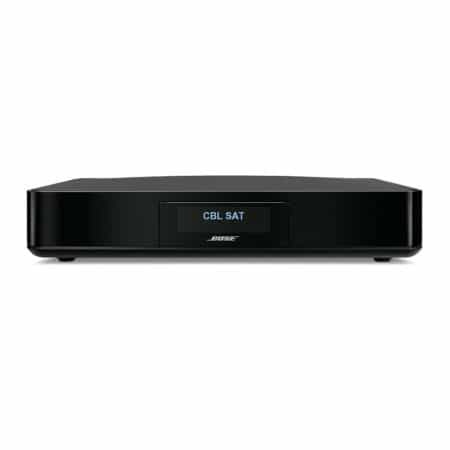 In addition to the direct connection from the TV, you can also wirelessly play music from any of your libraries – Prime Music, Spotify, Pandor, or even your own personal saved library via either Bluetooth or Wifi. The Bose SoundTouch 120 is amazing also because it has its unique AdaptiQ system. What this system does is actually calibrate the audio to the exact acoustics of the room so you’ll have a unique sound that sounds perfect in every single room. Or if you’re a bit more of an audiophile and have specific listening preferences, you can actually manually adjust the sound to go to whatever part of the room that you want – pretty cool if you ask us. As we mentioned, you’re able to use this as more than just a home theater system as well. You can play any of your music libraries through either Wifi or Bluetooth. With the Bose SoundTouch series of speakers, you’re actually able to set up a multi-room listening experience by setting up other SoundTouch speakers in different rooms, allowing you to play music throughout your entire house! This could actually be useful if you’re watching a movie as well. If you have a speaker in your kitchen and want to go get a snack, no need to pause the movie! You’ll still be able to hear exactly what’s going on. Overall, is the Bose SoundTouch 120 expensive ($849)? Yes. Is the sound experience that you get from Bose unparalleled? Also yes. Once you own a Bose product it truly is hard to go back to anything else. It has a multi-room listening experience, customizable audio paths, and a system that automatically calibrates the audio to each individual room. It’s pretty advanced for the price. However, with that being said, we know that not everybody wants to spend almost a grand just on a home theater system. That’s why on our list we’ve included a wide range of options. While we can guarantee that you won’t be disappointed with the Bose SoundTouch 120, keep reading to see about some cheaper options that won’t break the bank but will still sound amazing during any movie or music you want to play. While Bose is able to provide a rich, full, clear listening experience with only three speakers – sometimes if you’re going to pay a cheaper price, you’re going to need more speakers to get the job done. But that doesn’t necessarily mean you won’t still be able to enjoy a similar rich, full, clear listening experience! The Logitech Z506 are only a tiny fraction of the price that you’ll pay for the Bose SoundTouch 120 but they give you a few more speakers in order to make up for the quality. This set includes five speakers: a small sound bar to go in the middle front, two speakers for the left (one forward and one rear), and then two speakers for the right (one forward and one rear). Some people actually prefer to have actual physical speakers placed around the room as opposed to having to rely on one speaker to efficiently spread the audio all around the room. The Logitech Z506s are a great budget option that will still make any movie sound like you’re right in the middle of the action. While the $60 model of the Logitech Z506 don’t allow you to connect via Bluetooth to play your music, you can upgrade to an $82 model that comes with a Bluetooth adapter so you’ll be able to easily connect your phone or computer to play any music that you have in your collection. Or if you already have a Bluetooth adapter laying around your house – even better! You can buy the cheaper model and still reap all the benefits. On the subwoofer, there are also multiple inputs which make it super easy to connect your PC, game console, iPod, DVD player, etc. all at once without having to constantly be switching them out. Also on the subwoofer lives a dedicated knob that controls only the bass so there are no complicated settings to have to figure out if you want to adjust the sound settings. Then you can easily access the power and volume from the right satellite speaker so all basic settings that you’d need are readily accessible. And because of all the speakers that are included, while each one may not provide the widest sound – you have five of them so you’re still getting a similar experience to the Bose speakers at a fraction of the cost. For $60, you really can’t go wrong with these Logitechs. Something else that it does is it actually converts 2D sound to 3D. So if you have older CDs or DVDs laying around, it takes the flat sound that used to be used and converts it into a much more immersive sound for a more exciting listening experience. You’re able to attach multiple devices without having to go through the trouble of plugging/unplugging, it converts 2D sound, and can even come with a Bluetooth adapter if you so desire. 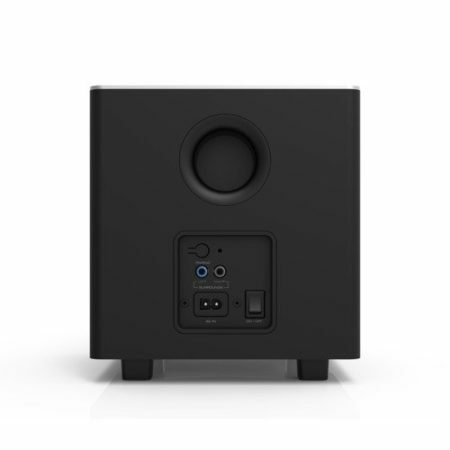 Sometimes with cheaper subwoofers, the bass can sound distorted and crackly but the bass on the Logitech Z506 subwoofer is both powerful and booming while remaining clear. All in all, it’s almost unheard of to be able to get an entire home theater system for $60 so if you’re looking to test out the waters of whether or not you think a home theater system is for you, this is the perfect unit to do it on. Up next we have another extremely trusted brand when it comes to the audio world – Yamaha. While it might be nice to not necessarily have five speakers floating around your house and to be able to create all the sound from just a couple of more powerful speakers, some people just prefer to have the actual physical speakers because they know they can rely on the sound to come out as opposed to having to solely rely on acoustics. This set of Yamaha speakers are sleek looking and are a great middle ground between buying $60 and $900 speakers. It also has an amazing bonus feature in regards to the video quality of your TV as well – but we’ll get into that later on in the review. Okay so while Yamaha might not be quite as popular of a name brand as Bose when it comes to speakers, does it still deliver similar audio quality? And if it does, what are you going to be paying for it? If you’re looking for something a little more advanced than the $60 Logitech speakers but not quite as extravagant as the $900 Bose speakers, we think we might have found a great compromise for you. Let’s first discuss the price of the Yamaha YHT-3920UBL. They’re almost exactly in the middle at $430. This is a great median price that puts higher end speakers in reach for everyone. Unlike the previous home theater system, these support Bluetooth straight out of the box. So in addition to being able to hook your TV up and take all your movies to the next level, you’ll be able to seamlessly connect your phone and play all your favorite music from the second you set it up. Similar to the set of Bose speakers we first reviewed, these Yamaha speakers also automatically calibrate to each specific listening environment. There are also tons of options for refinement with these speakers so if you are a bit more of an audiophile, these are perfect for you to play around with the more advanced systems. The quality and sound options are comparable to home theater systems that cost $1500. They have a powerful sound that will fill the largest of living rooms with full, crisp sound. These speakers are also particularly easy to wall mount and they even come with wires to help you do it! Unlike speakers that come on stands, you can easily tuck these away in the corner of your room without being noticed too much. And even if you aren’t able to set up the rear speakers in your room for whatever reason, you can still enjoy “surround sound” by having virtual speakers with 5.1 channel surround sound. This is similar to how Bose is able to create a surround sound like experience with just the sound bar. Whichever way you choose to use them, you’ll have a full listening experience that you’ll feel fully immersed in. The last feature we want to mention is the 4K Ultra-HD conversion. Not only will you get amazing audio with the Yamaha YHT-3920UBL, but it’s actually able to convert your existing picture to 4K Ultra-HD. If you’ve never experienced 4K TV before – once you do, you’ll never be able to live without it again. You’re essentially getting a new TV without having to purchase an ultra HD picture. We think that this reason alone is worth spending the money on the Yamaha YHT-3920UBL. Overall if you’re looking to get a lot of value for your money and wouldn’t mind the quality upgrade for your TV, go for the Yamaha home theater system. This is a rare find at this price and we can guarantee you won’t be disappointed. Onkyo is a lesser known brand when it comes to home theater systems but don’t let that fool you. They produce products that are every bit as high quality as Bose, Yamaha, or any other of the top brands. Like most home theater systems you’ll find, they employ a five speaker system to create the surround sound experience you’re looking for. You have one center speaker that you usually place under or above your TV, two speakers in the front (one right and one left), and then two satellite speakers placed behind you (one right and one left). Combined, they create a powerful, immersive listening experience that will make you feel like you’re right in the action of any movie. If this is your first time hearing of Onkyo, do not discount them. They are powerful speakers at a great price that rival speakers in the $3000 range. Alright – let’s get into the details. First off, the sound that comes out of the Onkyo HT-S5800 is flawless. You’ll experience virtually no distortion whatsoever, no matter how loud you like to crank up your volume for movies. They also come with Bluetooth capabilities straight out of the box with no need to buy any sort of Bluetooth adapter. Which means they’ll also be able to double as an audio system for your music. With the crisp clear sound, they really make live performances sound like they’re happening right in your living room. Listening to music in your home will never be the same again. These speakers use Dolby Atmos to transmit their sound. Because of this, you even experience sound from above which is pretty cool. Onkyo uses AccuEQ which will optimize the sound to suit the unique shape of your room. It’s essential to make sure the home theater system you’re buying has some sort of system that does this because the acoustics of every room can vary greatly. Setting these up is also extremely easy and you’ll be ready to watch your first movie in under 20 minutes. Onkyo also includes and easy-to-read diagram that will help you set up the speakers exactly the way you want them so connecting everything will be even easier. Still scared you’ll mess something up or just don’t want to have to deal with it? You can order expert setup through Amazon for only $186 to make sure you’re truly getting an optimal listening experience. While setup is extremely simple and Onkyo makes it easy even if you know nothing about the audio world, they also leave a lot of room for customization if you are a bit of an audiophile. These are great for sound designers and more advanced listeners because of all the options you have to play around with. These speakers fall a little bit above the middle of the range price wise at $580 but like we said, easily rival speakers in the $3000 range. Not to mention – these speakers look absolutely beautiful and have an amazingly modern design. Onkyo is a sneaky brand that we didn’t expect to have such high quality speakers with such a good design. They also include our favorite feature from the Yamaha speakers – they’re also able to convert your video into 4K! Another added bonus at a great price. The one downside is that older DVDs might not sound as great because of the format their sound is in but overall a pretty minor downside for all the other features included. Besides, who watches DVDs anymore with Netflix around? Pick up the Onkyo HT-S5800s, you won’t be disappointed. When talking about home theater systems, it’s hard not to include at least a couple of Bose options. They truly are the leader in the audio industry, especially when it comes to home theater solutions. However we redo realize that not everybody can afford (or wants to spend the money on) the $1000+ price tag when it comes to Bose and that’s okay! One great thing about Bose is that they create a wide variety of speakers that adjust to a bunch of different budgets. So even if you don’t want to go for a comprehensive home theater system, you’re still able to experience the quality and luxury that is Bose. The Bose CineMate 15 is exactly their solution to the money problem. While there are only two speakers pictured here, do not lose hope. Together, they still deliver a powerful listening experience that will fill up your entire living room. The Bose CineMate 15 includes the essentials – a powerful acoustimass to deliver deep booming bass and a rich full sound, and then a sound bar to provide all the highs and mids that you could dream of. The extremely deep bass that you get from the acoustimass truly bring movies, TV shows, sports, and video games to life. 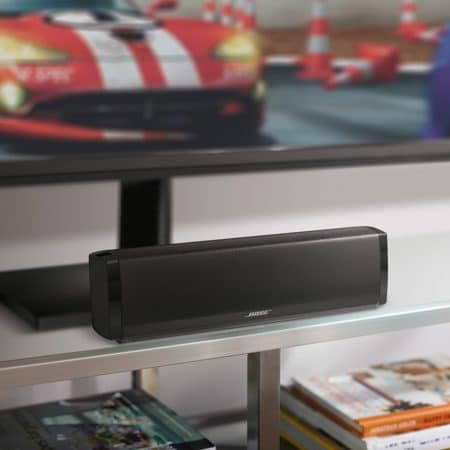 The sound bar will fit easily in front of your TV and easily connects with just one cable so there’s nothing complicated to figure out straight out of the box. Included with the duo is also a universal remote to control your new Bose speakers. It’s great because you’re able to program it to use for not only your speakers but for your TV, cable box, DVD player, and whatever else you might have. You unfortunately aren’t able to mount the sound bar straight out of the box so if you do want to do that, you’ll need to get creative. One solution is to buy a small shelf, mount that under your TV, and then simply place the sound bar underneath that. It’ll still look sleek and like it’s what you meant to do the whole time. If you don’t want the acoustimass sticking out in your living room, you can place it behind a piece of furniture or perhaps a curtain to keep it out of the way. The sound is so powerful you’ll still be able to hear it clearly without it being an eye sore in your living room. This speaker really shines when watching any sort of action movies or playing intense video games. You get a lot of lower notes and you’ll feel transported directly to the middle of the action. 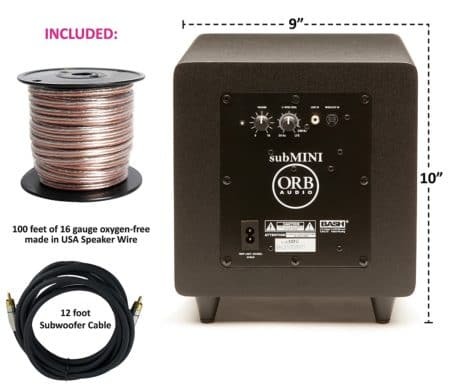 Not only is this a great deal if you don’t want to spend the money, but it’s also a great deal if you don’t necessarily have the room for a five speaker setup in your room. Or if you just don’t feel like dealing with the hassle of having to setup five different speakers, this could be the solution for you. It’s only $260, it’s extremely simple to set up, and you still get a full rich sound and the “Bose experience. If you’ve been wanting to try out a home theater system from Bose but have always thought that it’d be too expensive, then this is a great entry point to see if you think it’s worth the fuss. A little warning though, once you experience the magic that is Bose, you’ll have trouble going back to anything else. So proceed with caution! Maybe you have an extremely large, open space for a living room and are nervous that two speakers won’t cut it. Or perhaps you just genuinely prefer the more traditional setup of a “home theater system” where you have multiple speakers surrounding you. We understand. 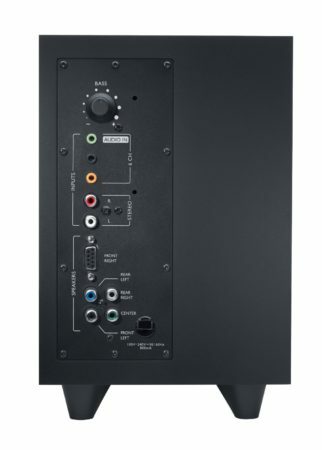 For those of you out there thinking that, the Onkyo SKS-HT870 might be for you. Not only are there two more speakers than the traditional five speaker setup, but they include two floor-standing speakers that are stunning and really make an impact in any living room that they’re in. Not only are they aesthetically pleasing however, the height really adds to the sound experience you’re getting. Between those two speakers and the five satellite speakers that you’ll have floating around your living room, you’ll be getting one of the most immersive surround sound experiences that you could hope to get. No need to fear any complicated setup with the Onkyo SKS-HT870. You can have these up and running in just about no time with color coded lines that make for an extremely easy setup. Even the biggest technophobes out there will have no trouble figuring out how to set this up. The professional design makes these speakers looks beautiful and will spruce up the aesthetics of any living room. Not only are they beautiful but they look expensive and like they cost much more than they actually do (these speakers will only run you about $380). One thing that we should note is that only some of these speakers are equipped for mounting. You might have to look for alternative solutions, aka velcro or perhaps shelves for the rest of them. Another surprise feature that we didn’t expect is that there is actually an iPod dock in one of the speakers! So while there might not be any Bluetooth, you can just pop your iPhone or iPod and you’ll be good to go. The highs and mids in this system are very detailed and clear so you’ll be able to pick up on every detail of sound no matter what you’re listening to. Not only will you get crystal clear highs and mids, but the subwoofer is calibrated perfectly so it’ll sound great in every room. It adds great bass notes and amazing low frequency effects. You’ll experience no distortion whatsoever. This home theater system is not only perfect for movies, but if you’re a gamer then you’ll be pleasantly surprised. It really makes any game that you play come to life. All in all, you are getting an amazing value from these speakers. Their powerful design coupled with their powerful sound make them almost unbeatable for under $400. Not to mention it even includes an iPhone/iPod dock so you’re able to listen to any music that you want through your home theater system without any additional hassle. These professionally designed speakers are visually stunning and will greatly add to any room that you decide to put them in. This is a great option for a mid-range budget while still providing impeccable sound. Onkyo comes in with another great option for a home theater system and truly knocks it out of the park. Go with the Onkyo SKS-HT870 and you will not be disappointed. Vizio is another big name when it comes to speakers, and especially home theater systems. They’re well known for providing quality at a price that’s not going to break the bank. And the Vizio SB3851s are not exception to this rule. Their price is completely reasonable at just under $300 and they provide a lot of quality for the price. They fall right in the middle of having to install five speakers in the living room and having just a sound bar. Included is a pretty long sound bar, a subwoofer, and two satellite speakers. One of the main selling features of these speakers is something that you very rarely ever see with home theater systems – the subwoofer and both of the satellite speakers are actually wireless! So when you’re setting these up you don’t have to worry about fidgeting with any wires or having to figure out where you’re going to hide the wires. You’ll still need one for the sound bar, but that shouldn’t be too much trouble as that will be placed near to where your TV is. So how does the Vizio stack up against the amazing home theater systems we’re already reviewed? Let’s find out! The Vizio SB3851 deliver true surround sound a legitimate best in class audio performance. It provides 100 dB of room-filling, crystal clear sound, and virtually no distortion. In fact, there’s less than 1% total harmonic distortion. That’s about as low as you’ll find at this price range. It also features built-in Bluetooth so you’ll be able to connect your phone, tablet, or computer straight out of the box. Vizio also provides premium audio with Dolby Digital and that audio is very expansive. It sounds like somebody dropped you down directly in the middle of all the action. You can either place the speakers on a table on you can wall mount them pretty easily. Since there’s only a few speakers, two of which are wireless, it’s particularly easy to set up and even if you know nothing about speakers or the audio world, you’ll be able to easily set these up. For only $287, these Vizio speakers really provide a lot of quality. It’s almost impossible to find speakers that give you 100 dB of room-filling crystal clear sound that has less than 1% distortion. Not to mention the fact that they’re wireless which is a pretty cool feature for speakers under $300. The sub woofer is small but the sound it produces is truly out of this world. The pairing of Vizio and Dolby Digital really cannot be beat. All in all, if you’re on a budget these are going to be some of the best speakers you’ll be able to get – but that’s not a bad thing! These speakers can easily compete with other home theater systems that are five times their price. So if you’re on a budget, don’t like complicated setups, love wireless speakers, or are just looking for a decent home theater system that’s reliable at a good price, the Vizio SB3851s are for you. And they do not disappoint. A home theater system by Yamaha is up next and is the second home theater system to come onto our list from Yamaha. They’re an often-forgot-about and underrated brand when it comes to home theater systems but when you really take a listen to them, Yamaha consistently delivers – and usually at a decent price. They manage to squeeze in a lot of features that is hard to get at this price point. While we have to admit, they may not be the most beautiful speakers in the world, that’s okay because they get the job done otherwise. They employ a five speaker system with a sound bar, two front speakers, and two rear satellite speakers. You’re able to either hang them on the wall (even the subwoofer since it’s so small) or just set them on surfaces around the room. Although it’s recommended to hang them to get the most out of the sound. So do the Yamaha NS-SP1800BL speakers deliver? And exactly how cheap are they? Do they deliver on all accounts – bass, mids, and highs? They absolutely do and we’ll tell you why. Yamaha delivers a rich, life-like sound with restored harmonics that give you crisp highs and an extremely accurate bass. Also on the subwoofer, there’s actually a removable grill cloth that keeps dust out and also helps to prevent unexpected damage to the speaker. You won’t find this with any other home theater systems. This may not seem like an important feature but it will truly save you money down the road if you work hard to maintain the original quality and cleanliness of the subwoofer. Speaking of the longevity of your home theater system, since speakers rely on powerful magnets to reproduce the sound, sometimes the magnets in the speaker can interfere with or damage other audio components if they’re placed too closely together. Fortunately, all the speakers in the NS-SP1800 system from Yamaha have actually been magnetically shielded in order to prevent damage. This will help to ensure optimal performance, allow for versatile placement, and make it so your speakers will last longer than they would otherwise. The center speaker that acts as a sound bar is extremely powerful and gives the most sound out of all of them. We should note that the subwoofer in this system doesn’t offer quite as many options for customization that you would find in other home theater systems, but for the price we can’t really complain. All in all, these speakers are good for the price. This definitely isn’t the most beautiful home theater system out on the market, but if you’re not overly concerned with aesthetics then it’ll be fine for you. If you really have no idea what you’re doing, they even come with expert setup through Amazon for $228. With the money you’re saving, it could be nice to have someone set them up for you. The setup is even guaranteed by Amazon. The quality of the service is guaranteed by Amazon so if for any reason anything goes wrong or it’s not done to your liking, you’ll have Amazon customer service to back you up. Which as most know, their customer service is second to none. We love these Yamaha speakers and know you will too. So give them a shot, they’re $160 – what could you possibly have to lose? It used to be the case when home theater systems were first becoming popular, that it’d be nearly impossible to find one that’s reasonably priced. If you wanted a true surround sound experience, you were going to have to pay for it. Now that they’re becoming more and more popular however, there are more systems on the market and companies are being forced to compete with each other on price. Not so great news for the companies but this is great news for the consumers! It means that now you don’t have to spend $500+ on a good home theater system. In fact on our list alone, there are two systems under $100 and multiple under $300. The Monoprice 108247 falls in the under $100 category. While you might have to compromise on design at these lower price points, you don’t really have to compromise on sound quality. Because what would the point be of companies creating cheaper and cheaper systems if they didn’t up the sound quality? If you’re looking for a good budget home theater system, you might have just found your pick with this system from Monoprice. Another huge bonus is that this actually includes wall brackets! This is very rare for a home theater system and while it’s not the biggest deal in the world, it will save you a bit of money and allow you to install them immediately upon their arrival. Also for $100, they even include Bluetooth! So not only can you experience your favorite movies in surround sound, but you can also experience your favorite music in surround sound as well. For $100 you would expect quite a bit of distortion, right? With these Monoprices you can actually listen to it with the volume all the way turned up to the max with barely any noticeable distortion. If you’re a bit of an audio geek and know what to listen for then yes, you will probably be able to notice some distortion. To the average listener however, these will sound just fine. The speakers might be small, but they are definitely mighty. Another big plus is the customer service that you receive from Monoprice. They provide exceptional customer service along with extremely helpful technical support. Any trouble setting it up or if they start to act weird after you set it up, just give them a call and they’ll be able to sort you out quickly and efficiently. These might be nice for a game room as they pick up on even the smallest of sounds and really immerse you in the action. We do want to note that they are a bit difficult to install initially. They don’t include a lot of the features that the more expensive speakers do to make it easy to follow. However, like we mentioned, they have stellar customer service so if you are having any trouble whatsoever, you can just give them a call and you’ll be up and running in no time. If you only have $100 to spare but still want to transform your listening experience in your living room, pick up the Monoprice 108247. Traditionally, home theater systems (and speakers in general, really) tend to come in black. They’re just the simplest color that appeases a majority of people. However we recognize that not everyone wants to have black speakers all around their living room. Or maybe you have a bright, airy space that would benefit from some white speakers. Well Leviton has your back! But don’t worry – if you fall in love with theses speakers but aren’t really digging the white, you can actually pick these up in black. While Leviton may not be the most popular name in the home theater system industry, they still manage to deliver extremely high quality speakers that not only look sharp, but produce an extremely high quality sound as well. They’re also reasonably priced and won’t break the bank if you go with these. But do they really compare to brands such a Yamaha, Vizio, or Logitech? Well they wouldn’t be on the list if they didn’t! Read on! As you can tell, this is a five speaker system out of the box. But the great thing about these is that if you decide later on that you want to expand your sound, you can actually add an additional speaker to make it a six speaker system with no hassle at all. These also include five architectural grade mounting brackets so they’ll look great in your home and you know that they’ll be sturdy and won’t be coming down anytime soon. We talked before briefly about the magnetic force from speakers that can sometimes interfere with other audio visual equipment. The Leviton AEH50-WH also provide video magnetic shielding. This allows you to safely put the satellite speakers directly next to a TV screen without causing any problems. This is perfect for when space is limited and you don’t have many options as to where you can put your speakers. Leviton puts a lot of research hours into their speakers and uses a very scientific approach to figure out where to put the sound. These are designed by engineers and you can tell. The sound is full and robust even when placed in asymmetrical rooms. And rest assured, this is no easy feat to accomplish. The sound that comes out of these speakers is very true to what the original sound is supposed to be. This is especially true when you’re watching a movie. It’ll sound like you were there when it was being filmed. Amazon also offers expert setup with these for $228 which might actually be useful if you want to take full advantage of the brackets that come with it. It’s truly not that difficult to hang them yourself, but if you want to make sure you don’t mess it up or aren’t that handy – consider splurging for the expert setup from Amazon. These are great mid-range speakers that come in two different colors and come with some heavy duty brackets. For $235, they provide a sound that sounds like they cost you $500. Not to mention if you want white speakers, these might be some of your only options. But aside from that, they really do sound great. We’re confident you’ll love them so we say give them a shot! You don’t have much to lose. If you really care about aesthetics and are looking for a home theater system that’s really going to elevate your living room and take it to the next level, the Orb Audio Mini 5.1 might be for you. These are stylish, modern, and just downright beautiful. Not only are they extremely beautiful (which is always an added bonus), but they also double as an audiophile grade stereo system for music listening. Some home theater systems are really geared only towards movies and fall short when it comes to music but not with Orb. When you’r watching a movie, you’ll be fully immersed and then after when you switch to music, it’ll sound like they were specifically made for listening to music. The sound is crystal clear and if you close your eyes, with a little imagination, you will truly be transported in time to wherever it is your music is coming from. The round shape isn’t an accident! While it definitely makes these speakers look more modern and stylish, it has an actual purpose. The best shape for a speaker cabinet actually is round. A circular shape is the shape that eliminates most of the distortion that you find in box speakers. A round speaker sounds much bigger and much more lifelike than a cube of the same size. Because of this, you’re able to have much smaller round speakers that produce just as full of a sound as square speakers that are 1.5 times their size. These Orbs are very easy to setup and even if you do run into trouble, you’re offered unlimited lifetime support through Orb. Unlimited lifetime support for as long as you own the speakers! Pretty sweet if you ask us. And their customer service is insanely good. They’re friendly, helpful, and will stick with you until your issue gets resolved. There are absolutely no tools required for setup and anything that you might need comes right in the box. Something that you can’t quite see from the photo, but you can actually stack these speakers on top of each other. So if your space is limited or if later on you want to upgrade your system to a six or seven speaker system, then you cane easily do so and just stack them on top of each other. This is an incredibly thoughtful design that won’t only look cool, but is practical and will save you tons of space. These speakers especially shine when you listen to anything with a lot of details – jazz, acoustic, or anything orchestral. You’ll be able to pick up on things you never even knew were there before. The same goes for any movie you might watch. You can clearly hear all the dialogue and every shard from the broken glass in your favorite action movie. It’s insane. For such amazing speakers, you would think that the price tag would be astronomical, right? Not the case. While they are definitely on the higher end of the price spectrum, they’re not as expensive as you would think for speakers of this quality. They’re just under $650, which we think is perfectly fair for speakers of this quality and design. Amazon does again offer expert setup for $228 but we don’t think you’ll really need it with these speakers. They’re super easy to set up yourself and if you are having trouble, the customer service from Orb is good enough where you won’t need to pay to have someone come to your house. We absolutely love these speakers and think they’re going to be hard to beat for the best home theater system of 2018. We couldn’t finish our list without sneaking one more home theater system from Bose in. The Bose Acoustimass 10 is definitely the priciest of the Bose systems on our list but it’s also the most comprehensive. This is a full home theater system from Bose that is luxury listening at its finest. These slim, beautiful speakers offer a premium, luxurious sound that will forever transform the way that you listen to music. If you care about your ears, you will buy these speakers. Our only true reservations that we have about these speakers – is the price. If price is no object however or if you really want to splurge, you need to consider the Bose Acoustimass 10. Besides, while they may be expensive, you know you’re getting a high quality product that you won’t have to replace for years to come. Let’s get the sticker shock out of the way – these speakers do cost around $1000. If you have a smaller living room, these also might not be for you. The sound they produce is very loud and full and if you have a small living room or live in an apartment building with thin walls, they might not be the best option. They truly shine when they’re in larger rooms. They deliver spacious sound that sounds amazing. You’ll be able to feel the powerful low note effects from powered Acoustimass module that contains two high-performance drivers. There are adjustable controls for volume and also low-frequency effect. If you hate the look of a subwoofer, you can easily and confidently place it out of sight behind a curtain or a piece of furniture and it will still sound amazing. These speakers essentially guarantee a distortion-free listening experience at the highest of volumes. Bose also uncharacteristically provides you with much slimmer speakers than usual. They’re also surprisingly easy to set up with wires that are clearly labeled so you can get these babies up and running in no time. 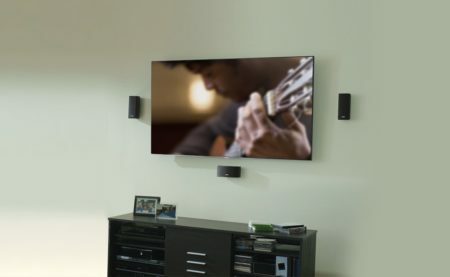 You are able to wall mount these but one thing to note – if you want to mount them you will need specific wall mounts from Bose in order to do so. This isn’t a giant deal and they aren’t too expensive, but just keep this in mind before running out and purchasing any old wall mounts. All in all, if you’re not worried about price, you need to at least try the Bose Acoustimass 10. It will transport you back to your favorite concert and make you fall in love with your favorite movie all over again. The sound is astonishing every time you listen to it and you will not be sorry you purchased these. We guarantee you’ll be happy and your ears will thank you. Home theater systems can be very very expensive so you want to make sure you’re making the right decision! Do you really need five speakers? What about bass? Wall mounting? What about customization options? Are the speakers better for a smaller room or larger room? These are all things you should consider before just jumping in and making a purchase. And we know it can be hard to keep track of all of the aspects so we compiled a handy little buyer’s guide to help you keep track of the important features. Take a look! More speakers doesn’t necessarily always mean more of a surround sound experience. Depending on the quality, you can often achieve a similar listening experience with just a sound bar and a subwoofer. This sounds crazy, we know, but it’s true. However if you’re a bit more old school or have a larger room, you might want to go with a more traditional five speaker set-up. Each room’s acoustics is unique. If you’re an audiophile and can figure out exactly what settings to adjust to optimize the sound for the acoustics of your room then great! Not everybody can, however and companies know that. A lot of home theater systems will automatically calibrate the settings to and individual space. So if you still want an advanced listening experience but don’t quite know what you’re doing, see if you can buy a system that will do so. And don’t worry – if you don’t like how it turns out, you can always go in and tweak the settings to your liking after. This could be a make or break for some people. For some rooms, the only option might be to mount but not every home theater system is capable of it. So if you don’t have a lot of surfaces to set the speakers on, then make sure you’re able to mount them. Also check to see if they come with wall brackets or if you’ll need to buy them separately so you won’t be disappointed when your home theater system arrives and you can’t set it up. Or in the case of some Bose speakers – you might need specific brackets that only the company sells. Either way – be on the look out, and be sure to watch the video below, which shows you how to setup your new home theater system. Do you plan on using your home theater system to also listen to music frequently? While with just about any system you can connect an AUX cable to listen, during this day in age, Bluetooth is really the most convenient listening experience. Most are in fact Bluetooth compatible but not all! And if you really plan on using them to listen to music, then you’ll want to make sure they’re Bluetooth compatible. If they’re not, it’s not the end of the world however! You can purchase a Bluetooth adapter for relatively cheap that will transform any regular home theater system into being Bluetooth compatible. But just be aware so you can prepare! There were a lot of amazing home theater systems on our list. And honestly purchasing even the most basic of systems is already going to transform the way you watch movies. After you buy yours, you’ll wonder how you went all this time without one in the first place. However, there’s definitely one that stood out to us. It was the best combination of quality, style, and price – three of the most important factors. But which one was it? Did Bose crush the competition? Or did one of the lesser known brands end up on top? The wait is finally over! We are about to announce the best home theater system of 2018. And that home theater system comes from….. Orb! Orb takes the cake with their Orb Audio Mini 5.1. We fell in love with these speakers. They’re modern and stylish, they provide an amazing audio experience, offer lifelong customer service, and their system is also expandable! If you move and get a bigger room and need a couple more speakers – you can easily buy them and add them to your arsenal. They transmit detail with exceptional quality. They’re also super easy to set up straight out of the box and you’ll be up and running in no time. They are a bit expensive at around $650, but we think it’s worth every penny. If you want real premium sound quality, the Bose Acoustimass 10 is definitely the home theater system to get. They’re simply incredible, but they cost a bunch too, so you have to decide how much you want to spend before you look for home theater systems, both wired and wireless. As always, thanks for reading! We hope this took some of the pressure off of finding the perfect system yourself. You’re well on your way to a completely different audio experience in your home no matter what home theater system you decide on. Happy listening!